In November 2016, under the EU Facility for Refugees in Turkey, the European Commission Humanitarian Aid Office (ECHO) launched the Emergency Social Safety Net Programme (ESSN), which provides monthly cash assistance to vulnerable people under Temporary and International Protection through the delivery of a debit card. Although direct cash grants programmes for refugees have been implemented by other agencies in other countries for a number of years, the ESSN is today one of the largest and most innovative schemes, benefitting over one million people. As the programme celebrates its first anniversary, this article discusses some of the key policy lessons that can be drawn from the implementation of the ESSN to date, both from a beneficiary’s and donor’s point of view. In his recent international bestseller, Utopia for Realists, Rutger Bregman has championed the idea of a universal basic income that would aim to transfer resources from frontline services for the most disadvantaged (particularly the homeless) into a monthly allowance that would enable the recipients to decide on how they wish to prioritize their monthly household expenses and therefore to benefit from public assistance in a more dignified way. The narrative on new ways to empower disadvantaged and vulnerable groups has gained considerable momentum over the past few years. And so has a range of initiatives and pilot schemes in a number of countries and cities. According to the Basic Income Earth Network (BIEN), which keeps track of all current experiments, unconditional monthly cash payments to selected disadvantaged groups are currently being tested in Uganda, the Netherlands, Finland, Kenya, Ontario and Scotland. While eligibility and implementation modalities may vary according to scheme, a common feature in all of them is that cash payments are not contingent on the beneficiaries having to demonstrate that they are seeking employment or that they will accept jobs offered to them, or have to report to the relevant social assistance authorities at regular intervals as in the case of unemployment benefits recipients. As crucially, cash payments can be used in any way recipients elect, including for the creation of micro businesses, without any established control or monitoring system. Although no systematic evaluation of any of these schemes has yet been released, initial observations and anecdotal evidence strongly suggest that such schemes have transformed considerably the ways in which recipients behave economically, feel less disenfranchised and gradually gain a more dignified status in society. But new forms of delivery of social and humanitarian assistance are not confined solely to the national disadvantaged groups. They are also being tested increasingly in humanitarian response settings and other situations of displacement, particularly in the context of the crises in Syria and Iraq, where needs have often outweighed available resources and where carefully targeted cash delivery options have gradually emerged as a viable alternative. Cash transfers in fact have a long history. For example, they were offered by the Red Cross during the 1870-71 Franco-Prussian War, in response to famine in nineteenth century India, and in Botswana in the 1980s. Over the past 30 years, UNHCR and its INGO partners, as well as several other humanitarian actors, have also been implementing similar programmes in a wide range of countries. And the response to the 2004 Indian Ocean tsunami was a turning point for cash transfers, as several aid agencies piloted them as an alternative to in-kind aid. The use of cash transfers in humanitarian response has been growing ever since and was estimated to represent approximately 7% of international humanitarian aid in 2015. At the EU level, one recent flagship programme that is attracting increased attention and that is starting to produce valuable lessons in terms of the benefits and challenges of delivering humanitarian assistance in innovative ways is the EU Humanitarian Aid cash-aid experiment in Turkey. Launched in late 2016, the Emergency Social Safety Net Programme (ESSN), which is funded by the European Union under the EU Facility for Refugees in Turkey and which is implemented in partnership with the UN World Food Programme (WFP), the Turkish Red Crescent (TRC) and the Turkish Ministry of Family and Social Policies (MoFSP), provides monthly cash assistance to vulnerable people under Temporary and International Protection through the delivery of a debit card. In particular, the ESSN card gives the recipients access to a fixed amount of money—around €30 per household member, with an additional quarterly top-up depending on the size of the family—every month. The card, which is accepted in all shops like any normal debit card, can be used to purchase whatever is needed and prioritized by the beneficiaries themselves: food, fuel, rent, medicine and bills. By October 2017, over one million people were benefitting from the card. The total beneficiary target is in the region of 1.3M based on current demographic criteria. So, in what ways has the scheme impacted the quality of aid delivery and its effects on recipients? After a year of implementation, a number of key lessons can already be drawn. 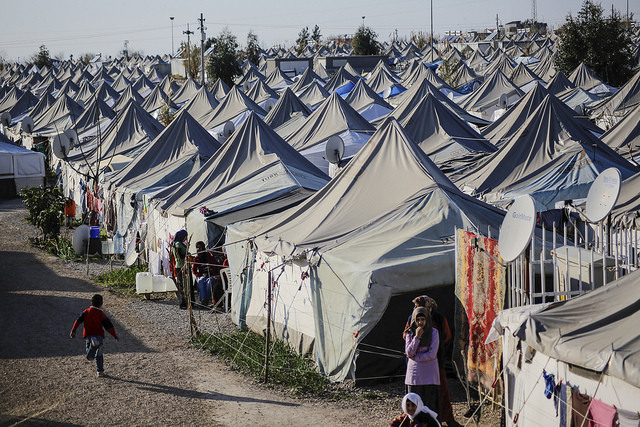 First, it is important to note that prior to the EU Humanitarian Aid strategy under the Facility for Refugees in Turkey, humanitarian assistance was delivered primarily in-kind or via restricted e-Vouchers. In this respect the ESSN card is noteworthy in that it now enjoys a national reach, unlike humanitarian aid delivery prior to the establishment of the card which was mostly confined to the south-east of the country in border areas and where aid agencies were physically present. The card has also proved to be a more dignified means of delivering assistance, since beneficiaries can now decide on what they need and when they need it. To date, on average for the whole country, 30–40% of the monthly card resources have been spent on food, 30–40% on rent, 8–10% on utility bills and 20–30% on other expenses. The card further provides predictability, since refugees can anticipate on what to expect every month and for how long, thus enabling them to better manage household budgets and in some cases even to save money. In that sense, it is also a more effective means of delivering aid, since refugees are clearly not a homogeneous group whereas traditional forms of assistance have tended to treat them as if they were. From a donor’s point of view, the ESSN card is proving to be a more efficient tool, due to the establishment of a single transfer system that limits the number of agencies delivering the same assistance, thus lowering overheads and the burden on the beneficiaries themselves. Today at least 85% of the cost of the programme is delivered directly to beneficiaries. As importantly, ESSN is a more accountable aid delivery tool than traditional means, since the single system is based on transparent criteria available to all and also provides for a complaints mechanism. Finally, the ESSN card has proved to have positive externalities for the local economy and is believed to have had a positive effect on social cohesion. Preliminary results indeed indicate that there is acceptance of the ESSN card within the national population. Based on this short overview, what can therefore be said about the policy relevance and possible replicability of innovative cash-aid programmes for refugees? First, the ESSN experience, in particular, has shown that when operating at scale for a large population group, spread across a national territory and in a protracted crisis, a system-based approach to humanitarian aid delivery can have a greater impact and be more efficient than traditional project-based approaches. In addition, emergency response modalities are not always fit for purpose in the medium and long term and are usually not fully adapted to beneficiary needs. They can also be costly and potentially patchy, thus leaving out a number of eligible and legitimate beneficiaries. The ESSN experience has further evidenced the benefits of building on government-run infrastructure (i.e. the MoFSP in the case of Turkey), in order to scale up assistance swiftly and across the country. A strong partnership and shared objectives between humanitarian actors with technical expertise and government agencies with capacity and reach, is clearly an essential element in the delivery of direct financial assistance (and indeed other forms of aid) to refugees at scale. As critically, a functioning market and an efficient banking system are additional success factors. Therefore, what the above observations suggest is that the ESSN scheme is not necessarily replicable in every single setting, in view of the number of pre-conditions that are attached to its successful implementation. However, one of the key policy lessons that can be drawn from the ESSN experience to date is that direct cash-aid to refugees is clearly an innovative tool that can benefit developed countries with a functioning social welfare system and with mature institutional and financial facilities. Political will, and the recognition that refugees are likely to remain in the host countries for a relatively long period of time, thus justifying the costs of setting up a system to scale, are perhaps some of the very few challenges that can still stand against the adoption of such schemes in major receiving countries. For humanitarian actors, the need to act collaboratively through a single system with pooled funding, rather than competitively through projects, is another important lesson that still needs to be learned. In that sense, the current humanitarian aid system does not appear to be well adapted to longer-term crises in middle-income countries, where the displaced are not residing in camps. And, these are the crises that are likely to occur with increased frequency in the future. In fact, cash assistance challenges the existing architecture of the humanitarian sector, where needs are assessed and addressed at a sector level with specialized agencies entrusted (and in some cases mandated) to deliver against some basic standards. Today, we are witnessing a struggle of institutional mandates, donor regulations and established norms, against a novelty that threatens the very nature of the way aid is delivered. There is a definite sense in which the outcome of the struggle is already predetermined: the humanitarian sector will, in time, be forced to adapt. The question is when? And what can be done to facilitate that transition and limit loss? There is an enormous opportunity here to effect positive change to the existing humanitarian aid modi operandi in man-made conflicts in middle-income countries that could have a knock-on effect in other areas of the world, ultimately enabling actors to do more with less, and better. In view of the growing number of cash-aid initiatives in the field of humanitarian and displacement affairs, the time might have come to undertake an in-depth and systematic evaluation of their key benefits and possible challenges in a number of policy areas. Hard evidence on the exact policy implications of such schemes for future humanitarian aid delivery is still in short supply and the production of a solid set of data and actionable conclusions could only serve better policymaking in the future, including within the framework of the on-going discussions on the UN Global Compact on Refugees. Solon Ardittis is Managing Director of Eurasylum and a research fellow at both the Institute for the Study of Labor (IZA) and the Global Labor Organization (GLO). He is also co-editor of Migration Policy Practice, a bimonthly journal published jointly with the International Organization for Migration (IOM). The evidence is absolutely important and should guide policy of relief as widely as possible. Thank you. To all concerned humblest respect and best wishes for your success.